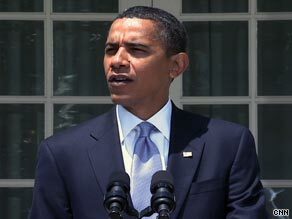 WASHINGTON (CNN) -- President Barack Obama said Friday he looked forward to signing a bill that would give the Food and Drug Administration power to regulate the manufacturing, marketing and sale of tobacco. President Obama, speaking to reporters Friday, said the tobacco bill was a "long time coming." He said the bill was a "long time coming," and said he was pleased that the House of Representatives and Senate acted "swiftly" in passing it. The Senate passed the bill on Thursday, and the House passed the Senate's version on Friday by a vote of 307-97. The House had passed a similar measure in April, but needed to approve the Senate version, which passed Thursday. The Senate passed the bill 79-17 Thursday, with most Senate opposition coming from tobacco-producing states, including Kentucky, North Carolina, South Carolina and Georgia. In a break from tradition, Virginia's two senators supported the proposal. The legislation would give the FDA power to ban candy and fruit-flavored cigarettes, widely considered appealing to first-time smokers, including youths. It would prohibit tobacco companies from using terms such as "low tar," "light" or "mild," require larger warning labels on packages, and restrict advertising of tobacco products. It also would require tobacco companies to reduce levels of nicotine in cigarettes. Altria Group, which owns Philip Morris USA, the nation's biggest cigarette company, called the vote "an important step forward on this legislation." But it expressed "First Amendment reservations about certain provisions, including those that could restrict a manufacturer's ability to communicate truthful information to adult consumers about tobacco products." Phillip Morris makes such brands as Marlboro, Virginia Slims, Chesterfield and Basic. iReport.com: Should cigarettes be banned? There was no immediate response from R.J. Reynolds, which makes Camel, Kool, Winston and Salem cigarettes.